I started vegetable gardening in earnest two years ago, and given my tiny little urban yard, square foot gardening made a ton of sense. If you’re not familiar with the method, it’s basically what it sounds like: rather than arranging plants in rows, you divide your gardening space into square feet, and plant specific edibles and ornamentals in each square. It is a simple method of getting started as a gardener, or simply making more efficient use of small yard space. But, as with any form of gardening, it also presents a gardener with a number of decisions to make. And if you’re new to raising some of your own food, even a simple system like the square foot garden can feel a bit overwhelming. Of course, reading Mel Bartholomew’s All New Square Foot Gardening (affiliate link) is a must for anyone wanting to try out the method… but because it’s become so popular since Bartholomew introduced it in the 1970s, an open source movement of sorts has sprung up around the square foot garden. Many have published tips, tricks, plans, layouts… and even created online and mobile tools to help a newbie or an older hand make his or her way through the planning and implementation of their garden. I keep Mel’s book close at hand… but have also found lots of really valuable information online from other square foot gardeners. And, of course, I’ve learned a bit in my own three growing seasons of trial and error. Here’s some of the best of that information. But I don’t view this guide as complete… let’s keep the open source mentality going. 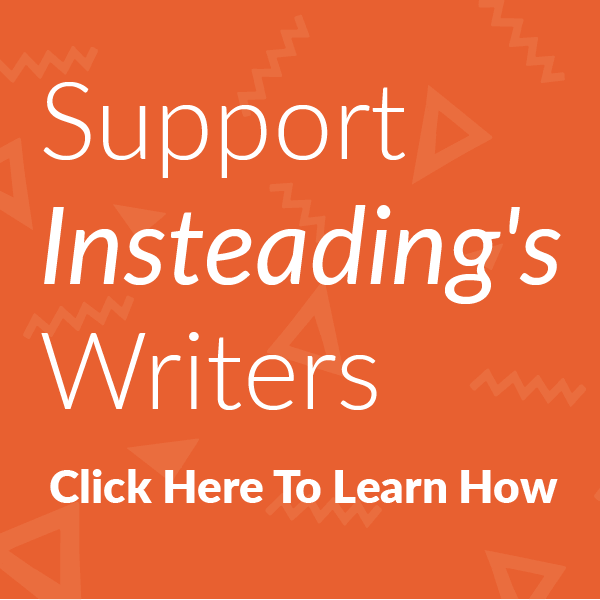 If you know of better resources, share them… and I’ll add them. One of the beauties of the system: no digging! The “new” version of square foot gardening uses raised beds, and a soil mix placed in that bed (which we’ll get to). Yes, you can buy raised bed systems, but they’re also pretty easy to put together yourself. Most plans (including those in the book itself) use lumber (untreated redwood or ceder is recommended), but a number of other materials (that you may have on hand) can work just as well. Bricks: This was my solution… had a bunch of them laying around after we pulled up part of the backyard patio. I stacked them three high (to get a bit more than the minimum six-inch depth), and didn’t worry about mortaring or otherwise attaching them to one another. It’s not as pretty as some solutions, but works well, and cost me nothing… take a look… as you’ll see, it withstood a pretty nasty hail storm. Cinder blocks: Yep, they’re heavy, but they also provide the needed depth… and, as a number of members over at Gardenweb point out, they also give you extra planting space for herbs, flowers, or even strawberries. Recycled tires: Nope, you don’t fill and stack them Earthship style (though I guess you could)… you can actually make boards out of old steel-belted car tires. This plan from the Noble Foundation is a bit more labor-intensive, but cheap and unique. Wooden pallets: Like tires, wooden pallets are everywhere… and often end up getting thrown away. You can find numerous sets of instructions out there on how to turn those pallets into raised beds… the best I’ve found come from 5 on the Farm (below), the Gardenhacker.com podcast, and weblamer on Instructables. Twine: That’s what I use, and it works well with my stacked brick beds… I mark the one-foot divisions on the bricks themselves, and then tie the twine around them at that point. Mini blind slats: Mel recommends these in the book, and suggests looking for them at thrift stores (if you don’t already have old ones stashed away somewhere). Bamboo stalks: That’s what user Peela at The Well-Trained Minds forums recommends. I use these for staking up plants that need it, but they’d work well for dividers, also… and give your garden a unique look. “Mel’s Mix” is the recommended soil mix for a square foot garden: 1 part vermiculite, 1 part peat moss, and 1 part compost. The first two items can be purchased at most garden supply stores, and don’t need to be amended or replaced: once they’re in your beds, they’ll stay useful as moisture retainers. Compost, however, is a bit more challenging, as you need to add it when you pull plants out, prepare beds for a new planting season, etc… it’s the element that provides nutrition for your plants. Mel recommends mixed compost: that is, compost with at least five different types of materials in it. Composting overview: Treehugger’s slideshow “8 Ways to Compost and Which One You Should Try” provides a great overview of common composting methods. DIY Outdoor Composters: If you don’t want to use the pile method (which can get a little unwieldy), there are plenty of plans out there for DIY compost bins. Some of the best come from Compost Bin Plans (a collection of Youtube videos on DIY bins), the Happy Housewife, and Instructables (a tumbling composter… a bit more difficult). Worm Composting Bins: Don’t want to compost outside (or don’t have room)? A worm bin is great for indoor composting… if you do it right, the worms won’t get out and it won’t smell. One of the best resources for making and maintaining a worm bin: the Whatcom County (Washington) Agricultural Service’s Cheap and Easy Worm Bin page (yeah, it’s not pretty, but the information’s great). Bokashi Composting: This Japanese method technically isn’t composting; it’s a fermentation process. One of the main upside: you can deal with any kind of kitchen wastes in a bokashi bucket… including meat and dairy. It also works faster than typical composting methods. 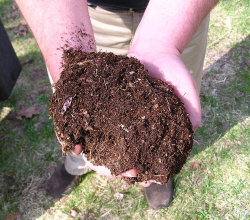 Compost Guy’s page on bokashi takes you through the entire process. Buying Compost: OK, don’t want to collect and compost your own organic wastes? You can purchase compost from garden and home centers, nurseries, and other places that sell gardening supplies. What kinds of compost can you buy? The official Square Foot Gardening Forums has a great (though long) post on buying compost (as well as the other ingredients for Mel’s Mix). Mixed compost: Most commercial brands are single material compost… a few small companies like Ecoscraps do sell mixed compost. Don’t step in the “biosolids”: Because that may be a code word for “sewage sludge.” There’s debate over the safety of such material in commercial compost, but if you’d rather avoid it, Rodale has a helpful article on how to spot commercial compost with biosolids. Municipal compost: If your town, city or county asks you to separate yards waste or other organic wastes from other trash, they’re probably composting it. You may be able to get compost from them for free or cheap. Some worry about the presence of plant disease and/or synthetic chemicals in municipal compost: this thread at GardenWeb provides a good overview of some of these concerns. Plant multiple beds? 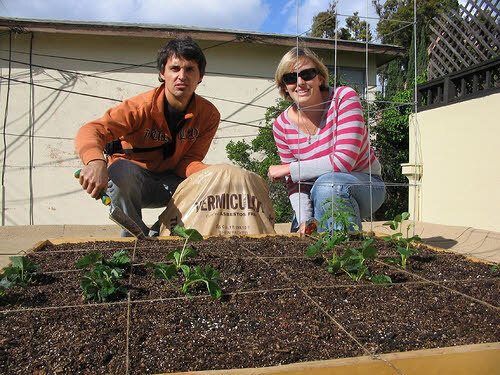 : So does Tim of Tim’s Square Foot Garden (a huge site on the topic). He has diagrams of how he arranges plants in multiple beds from season to season. Using companion planting? : That’s my experiment this year: arranging plants so that they benefits one another’s growth. As ziggy’s already noted in an earlier post, Wikipedia has a great chart of companion plants… but if you want to figure out how to make that work in a square foot garden, check out Emily’s companion planting tool at My Square Foot Garden. Started using SFG a couple of years ago. Since then I’ve moved onto Permaculture, but still use many of the philosophies to produce a ton of veggies from small spaces. Thanks, Skot! You know, I did look around for some information on overlap between SFG and permaculture… if you know of any good sources, I’d love to add them. Hello! I have been gardening in the high country of Breckenridge, CO at 9,600 feet for 3 years now. I do a raised bed garden because the soil is so important–I use a mix of top soil, compost, and horse manure–and the rocky soil in the mountains here are not ideal. The raised bed design allows me to have better soil, and in addition, I build a cold frame which protects my plants from the occasional hail storms that we get in the summer. The cold frame is made inexpensively using pex tubing, commonly used in plumbing, and painter’s plastic. It helps hold in the heat during cold nights as well, as it is common for us to get a frost into the months of June. The cold frame helps to extend the growing season, but you have to water almost daily because it does not allow any rain water in. I love the whole square-foot gardening idea. I’ve used in with small gardens and large, and it always increases my productivity. I didn’t realize that there was an updated version of the book. Must buy! Easy Upcycling: Give New Life To Old Lampshades – With A Stencil!